Hello friends long time no blog posts but I am hoping to blog more in the near future.This little card I made at my friends house Stampin up demonstrator Kate Martin. 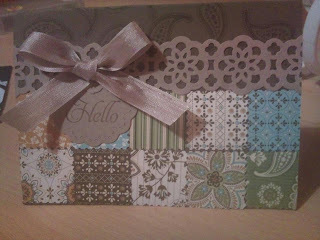 I enjoy my evenings so much making stampin up cards. I really love this paper it is called spice cake.I think the next few cards posted my well be Lili of the valley followed by more stampin up watch this space. It's about time you blogged!! You did a real good job of this card. whoo hoo that's fab i love stampin up goodies.